Japan specialists? Can this be a ESP/Navigator without logo? 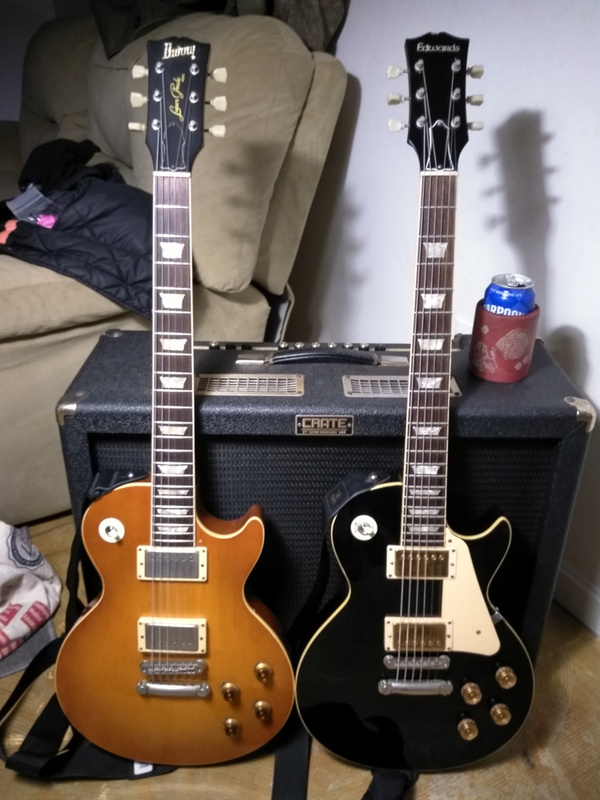 Hope u can help me out here.. this is by far the most wellbuilt les paul I have ever own, compared to ex. Gibson Les Paul Standard, Orville by Gibson etc. which I own right now.. It has one piece mahogny body, looks like one piece maple cap to, fret end bindings of top quality, aluminium tailpiece, and have a outstanding acoustic tone and long sustain..
Theese things on the pics are not original right now: tuners, mpickups & mounting-rings and the knobs. It weights 4.870 kg (10736 pounds). Yes. Correct cavity shape for Edwards. Any numbers on the pots? hmm, every Edwards i’ve seen have wrong placement of vol and tone pots, this one has exact Gibson correct placement..
Tenon looks different from the 2 I owned. Both Edwards I had a full tenon joint and was so precisely cut. Also the trussrod has 2 screws. Not sure I’ve seen an Edwards where the trussrod opening didn’t extend down to the nut. Looks more like a 90s Edwards. My 2001 Nav had a tenon like that but those inlays are the cheaper type akin to Edwards. Is it on the heavier side? yes it’s heavy, It weights 4.870 kg (10736 pounds). but why does it not have a logo in the headstock..? Under what name did you get the guitar? i.e. it was marketed as what? Navigator, Edwards, etc or just a Japanese replica? It may be a no name replica.. from the pics and description, it seems to be very well built ! Does it have some repair on the back of the headstock? wat can it be worth? ?, its a crazy build quality and plays like a dream.. Typical 90s ESP X route in the control cavity. It is ESP for sure, I think it is an early Edwards or even a Rockiin shop guitar. It could even be a Nav but the early Edwards and Navs were pretty much identical minus the finish being poly vs lacquer & inlays. what are Rockin shop? never heard of it.. i just did the acethone test and its not nitro... but i still not get it - why not a logo? i read somewhere early esp were branded as legend for Europe.. so maybe ..but a lower end model at the time..
hmm ok, but this is for sure not a low end..
by lower end I mean poly not nitro.. I have 2 Edwards LPs with what appears to be 1983 pots in them. Yours also looks to be 1983. Could be 93 maybe. 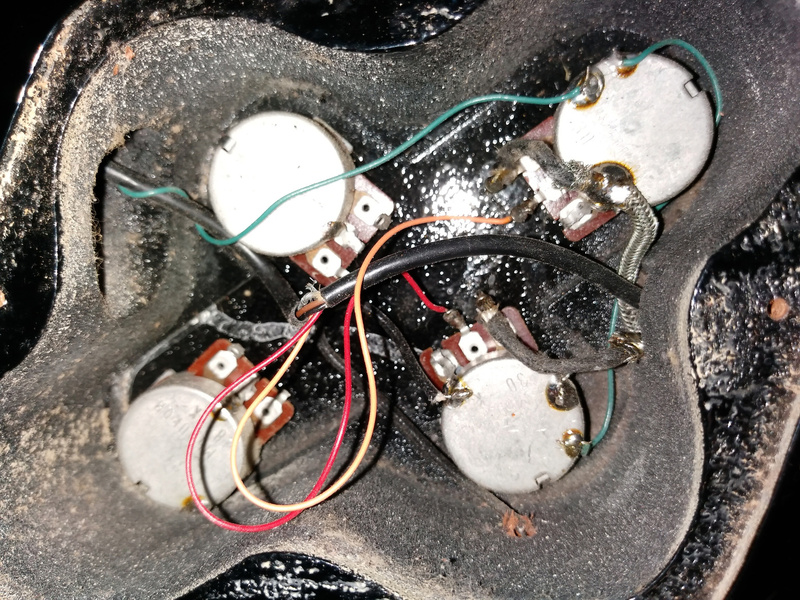 This one never had tone caps installed. Both of them have 2 screw TRC, but early Edwardigator style. thanx for all help it’s a killer but thinking of selling anyway, have to many guitars right now..